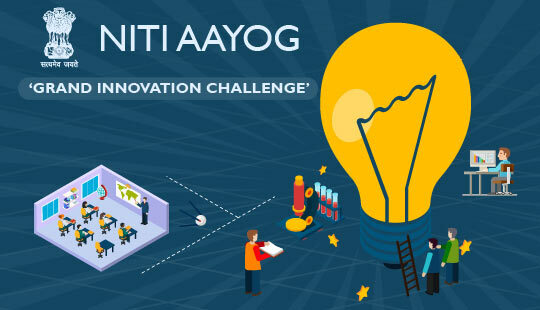 The National Institution for Transforming India (NITI) Aayog launched today the first phase of the ‘Grand Innovation Challenge’ to seek citizens inputs on the key developmental challenges facing India. The ‘Grand Innovation Challenge’ is being launched on the MyGov portal, to involve citizens at the very first stage in innovating for India’s development. The idea is to work together with the States and every citizen as Team India to ensure progress. leaving no one behind. The focus is on the social sector, the most vulnerable sections and to involve citizens in crowd sourcing ideas to address challenges facing India’s development. In Phase I of the Grand Innovation Challenge, NITI Aayog will seek the views of the citizens on the key challenges facing India, across areas significant for the country’s development. The idea is to find out from the people what are the critical issues which need to be addressed to develop the social sector and the challenges which need to be tackled on a priority basis. Phase I of the Grand Challenge ends on April 25th. Entries should be submitted here: https://mygov.in/task/niti-aayog-grand-innovation-challeng.